We have three modern and spacious places to stay for individuals, families, a group of friends, or retreat facilitators and participants. Each of these tranquil properties has unlimited use of a private hot mineral spring bath, a full kitchen and comfortable beds. All are located in downtown Truth or Consequences and just a few minute walk from all of your food, art and shopping needs. If you are organizing a retreat or other event that requires accommodations for more people, please let us know and we will provide recommendations of other places to stay. We will be adding more rooms this year and more to come. To inquire about availability or to book one or all of the rentals below, please contact us. This private guest house has one cozy bedroom plus a comfortable pull-out couch in the living room, a full brand new kitchen with granite countertops, and an outdoor shower next to the hot mineral bath and private deck. 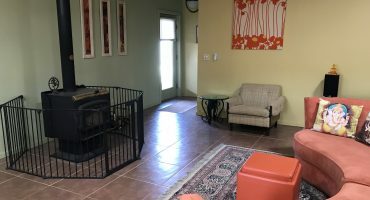 The Teal Cottage can be connected to Casa Mañana by opening a sliding fence in the backyard, if two families, a group of friends, or several retreat participants want to stay all together. 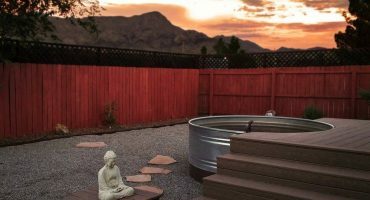 You'll be sure to love this charming and spacious two-bedroom guest house with a private deck and hot mineral bath. It's cheery colors, bamboo floors and mid-century modern furniture make it a unique and unforgettable getaway. Casa Mañana can be connected to the Teal Cottage by opening a sliding fence in the backyard, if two families, a group of friends, or several retreat participants want to stay together. 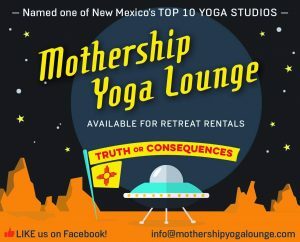 The Mothership Yoga Lounge (MYL) residence is located in the same building as the yoga studio. 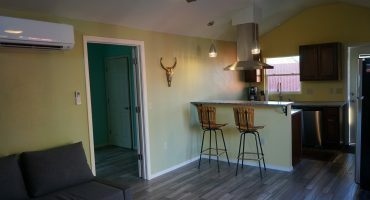 It’s a super groovy 2,500 square-foot home with 3 bedrooms (1 King, 2 Queens), 2 bathrooms, an office, huge kitchen, and large private outdoor deck with an amazing hot mineral bath and a BBQ. This property can be rented with or without the studio; and as either a 3 or 1-bedroom.